A century ago, most Asian Americans were low-skilled, low-wage laborers crowded into ethnic enclaves and targets of official discrimination. Today, they are the highest-income, best-educated and fastest-growing racial group in the United States. And they are the most likely of any major racial or ethnic group in America to live in mixed neighborhoods and to marry across racial lines. 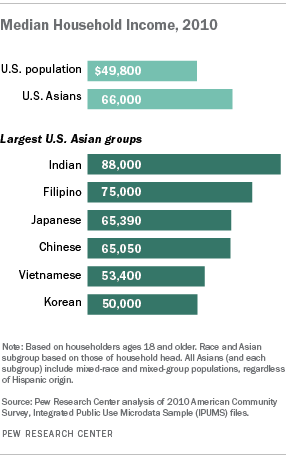 The 2010 Census counted more than 17 million Asian Americans, or 5.6% of the U.S. population. Asian Americans are a diverse population coming from dozens of countries in the Far East, Southeast Asia and the Indian subcontinent. Each country of origin subgroup has its own unique culture, language, religious beliefs, economic and demographic traits, social and political values, and pathways into America. The Asian-American population grew faster than any other race group from 2000 to 2010 and its numbers roughly quadrupled from 1980 to 2010. They are immigrants from Asia (59%) or are descendants of immigrants (41%). Roughly eight-in-ten trace their roots to China, India, Japan, Korea, the Philippines and Vietnam. Despite often sizable subgroup differences, Asian Americans are distinctive as a whole, especially when compared with all U.S. adults, whom they exceed not just in the share with a college degree (49% vs. 28%), but also in median annual household income ($66,000 versus $49,800).